Workers Fund Iran (WFI) was founded in December 2005 inspired by suggestions from veteran Iranian labour activist Albert Sohrabian (1927-2004). WFI aims to reduce and relieve poverty amongst Iranian workers (both employed and unemployed). The money-and-media election complex has transformed longstanding problems into an existential crisis: we are about to lose the democratic promise of elections. It is hard to see how our cherished freedoms can then survive, except to the extent that they are trivial and unthreatening to those in power. What hangs in the balance is democracy itself. housands of protesters have converged on the French Riviera to urge the Group of 20 leading economies to focus on spreading global largesse more equitably instead of saving banks and pleasing financial markets. 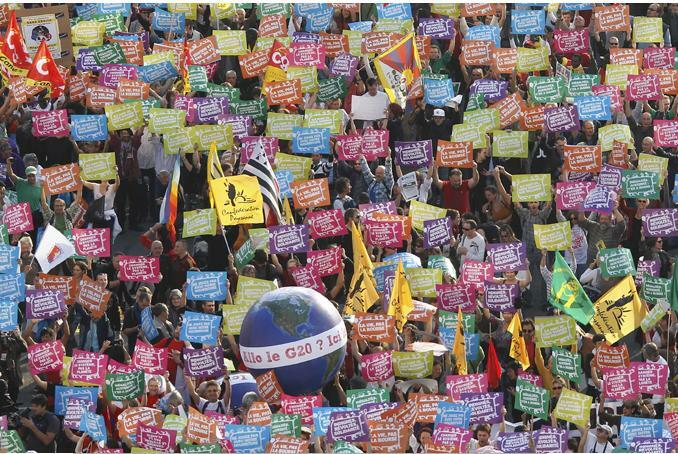 Scores of French and international activist groups with a range of missions - from a tax on financial transactions to better environmental protection and fairer labour laws - are organising protests around the summit of G-20 leaders in Cannes on Thursday and Friday.